Former Pasteur Institute President, Dr. Christian Bréchot, joined USF Health in Oct. 2018. USF Health is continuing to strengthen its offerings in both research and treatment of diseases by recruiting high-profile scientists and physicians from around the world. One of their latest additions is Dr. Christian Bréchot, the former president of France’s renowned Pasteur Institute. Bréchot, 66, joined USF Health in Oct. 2018. He'll serve as senior associate dean for research in global affairs, associate vice president for international partnerships and innovation, and a professor in the Division of Infectious Disease, Department of Internal Medicine. “When my mandate at the Institute Pasteur had finished, I really wanted to go to the U.S. with my wife, it was a longtime dream,” said Bréchot. After considering a number of offers, he chose USF Health. 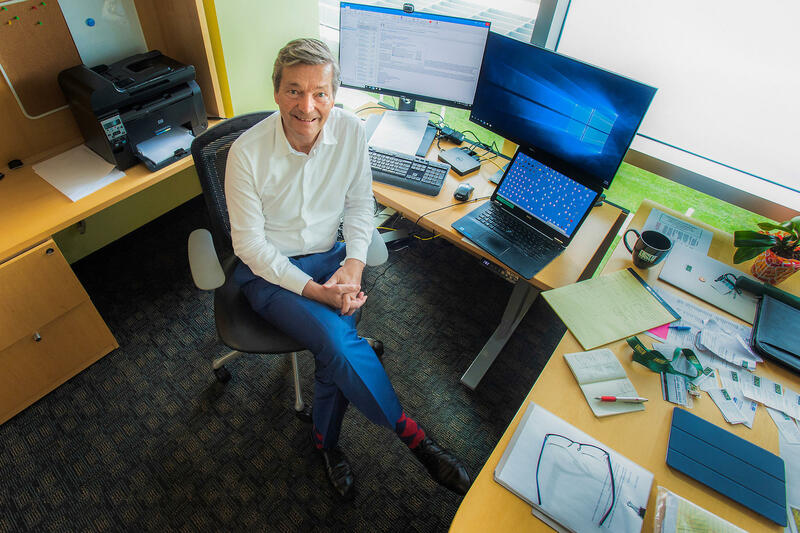 University Beat talks to Dr. Christian Bréchot, the former president of France’s Pasteur Institute who has joined USF Health. Bréchot brings an expertise in the liver and hepatitis B and C, including being ranked as the fourth most cited author on hepatitis C by the Institute for Scientific Information in 2005. One thing he’s studied closely is the connection between the two diseases and liver cancer. In addition, Bréchot is studying the microbiome – the collection of bacteria, viruses and other microorganisms found throughout the body, mainly in the gut. Bréchot adds that research shows that when there’s perturbation of the microbiome, it can impact a number of diseases, including diabetes, obesity, heart disease, some neurodegenerative and inflammatory bowel diseases, as well as some cancers. “This is an area where now we can foresee intervention, treatment, and this is exactly what I want with all my colleagues because a lot of things are already being done (with the microbiome) at USF,” he said. In addition to conducting research on virology and the microbiome, Bréchot will help USF recruit new faculty and researchers and establish and reinforce international collaborations. The Pasteur Institute Bréchot led from 2013 to 2017 is similar to the Mayo Clinic, with a global network of 33 institutes in more than two dozen countries. He plans to use the contacts he made in that position to help USF Health expand its international outreach. Bréchot will also serve as a recruiter for USF Health, with a charge to add renowned researchers and clinicians to what he calls the university’s highly-skilled faculty. The first two specialties he’s focusing on are the microbiome and virology. “Florida is an area where viruses, in particular viruses transmitted by mosquitos are very important, this is an entry point for the U.S., and so we want to reinforce the critical message at USF in these areas,” he said. Bréchot will also focus on building programs that merge different departments at USF Health. “One of the key challenges of modern science, of modern medicine, is really to go for interdisciplinary research, so we need to avoid only thinking in siloes,” he said. Bréchot was also general director of Inserm, the French national agency comparable to the U.S. National Institutes of Health, from 2002 to 2007. He also was a professor of hepatology and cell biology at Necker School of Medicine at Paris Descartes University from 1997 to 2001. In addition to working at USF, he’s serving as the executive director of the Romark Institute for Medical Research in Tampa and the president of the Global Virus Network. And medicine is in his blood – every generation of Bréchot’s family, dating back to the 17th century and King Louis XIV of France, had at least one medical doctor in it. That bloodline continues – his wife, Patrizia Paterlini Bréchot, is also an MD/PhD specializing in genetics and cancer, while two of their five children are also MD/PhDs: a daughter who is a cancer immunologist at Penn State University and a son who directs an intensive care unit at a hospital in Paris. The University of South Florida College of Nursing has received a $2.7 million grant from a branch of the National Institute of Health (NIH) to conduct a study of the gut microbiome in premature infants and determine how it affects their growth and development. Maureen Groer, PhD, is the Gordon Keller professor at the USF College of Nursing. She also serves as the lead researcher of an interdisciplinary team of USF scientists conducting the study. Extended University Beat report on the USF College of Nursing study of the gut microbiome of preterm infants.